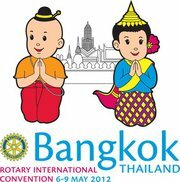 The 2012 Rotary International Convention in Bangkok will be a once in a lifetime opportunity. Click here to learn more about why you should. Discounted airfare for the Rotary International Convention in Bangkok is available from Thai Airlines, United Airlines and the Star Alliance partners are offering 10-15% discounts off of economy class airfares and up to 20% off of business class airfares for convention attendees. Use Airline Event Code – UA03S12. Zone 28 & 29 also has special airfare packages available with Cathay Pacific Airways, with round trip tickets at $1,474 per traveler. Click here for more information. Zone 28 & 29 will also again offer a dinner cruise. Click here for more information. about Bangkok and the convention.